Bogdan Božović enjoys a versatile international career as chamber musician, soloist and chamber orchestra leader. As violinist of the world-renowned Vienna Piano Trio from 2012 to 2015, he has toured Europe, the Americas and Asia, appearing in some of the most prestigious chamber music venues, including the Wigmore Hall in London, Concertgebouw Amsterdam, Konzerthaus Vienna, Cité de la Musique in Paris and The Frick Collection in New York. He has made two critically acclaimed recordings with the ensemble on the label MD&G, featuring works by Beethoven and Saint-Saëns. His chamber music festival performances include IMS Prussia Cove Open Chamber Music in Cornwall, England (member of the tour-ensemble in 2011), Chamber Music Connects the World in Kronberg, as well as the Prades, Båstad, Gstaad, Whittington, Nuremberg, Caramoor and Ottawa festivals and series. Among his chamber music partners are Steven Isserlis, Christian Tetzlaff, Elisabeth Leonskaja, Lukas Hagen and Veronika Hagen. His live recordings have had multiple international broadcasts including those by BBC Radio 3, Radio France, WDR 3, NPO Radio 4, WQXR-FM New York and Radio Beograd. 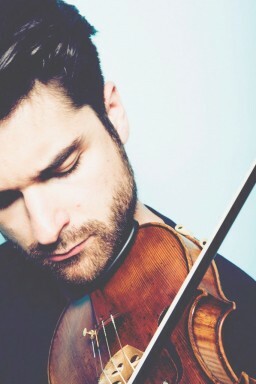 Bogdan’s recent solo-appearances include the Schumann Violin Concerto with the Symphony Orchestra Basel. He has been guest leader of the Vienna Chamber Orchestra, Ensemble DIAGONAL Basel (in their Lucerne festival-performance), Ensemble Phoenix in Basel and others. He is a founding member of the Leondari Ensemble, resident ensemble at the annual Saronic Chamber Music Festival in Greece. Bogdan has given master-classes at the Royal College of Music in London, Leeds College of Music and has been a tutor at the chamber music seminar MusicWorks in West Sussex/England. A native of Belgrade, Serbia, he studied with Vesna Stanković at the Faculty of Music in Belgrade, Klara Flieder at the University Mozarteum Salzburg and obtained his masters degree with distinction in the class of Rainer Schmidt at the Basel Academy of Music. Other important musical influences were from lessons with Ferenc Rados, Pamela Frank, Chiara Banchini (baroque violin) and collaborations with contemporary composers such as Heinz Holliger and Georg Friedrich Haas. Bogdan plays on the “ex-Arma Senkrah” Stradivarius violin from 1685, on generous loan from the Ruggieri Foundation.